Cabo San Lucas is known for many things-gorgeous weather, sandy beaches and clear water. It’s really what visitors fall in love with and come back for again and again. For those interested in marine life, the snorkeling conditions in Cabo San Lucas are top-notch. You will see incredible marine life in some of the clearest water in Mexico. 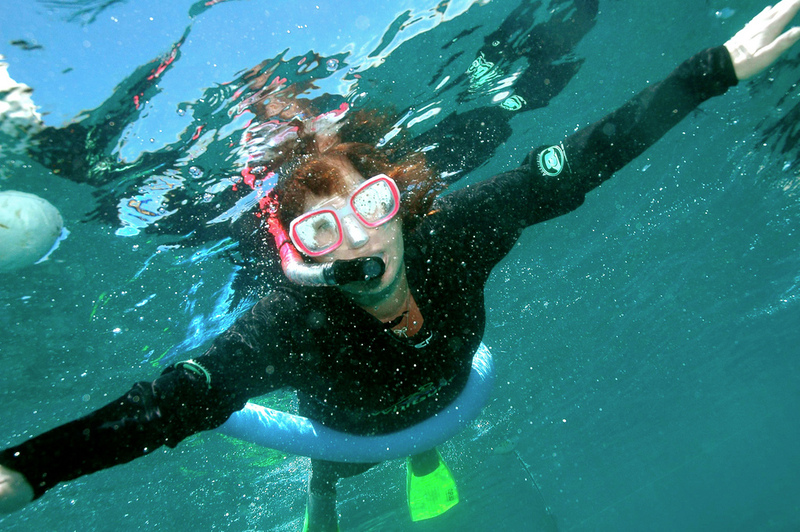 Santa Maria Bay is one of the most loved snorkeling destinations in Cabo. We’ve put together a guide for snorkeling in Santa Maria Bay with La Princesa –one of Cabo Villas Beach Resort’s recommended activities companies. It is an experience we know you won’t forget. You will be amazed at how much you will see. The underwater visibility in Santa Maria Bay ranges from 20-30 meters (65-98 feet). This gives swimmers the ability to see all of the animals that live under the water. As you swim, you will see a variety of marine life including eels, octopus, sea turtles, manta rays, hard and soft corals and hundreds of tropical fish. There are a few things that you will need to bring with you on your adventure to make sure that you have a great time. Those planning on snorkeling will obviously need a bathing suit and towel. Most importantly, don’t forget your sunscreen. Your snorkeling adventure with La Princesa lasts 3.5 hours, and the sun on the water is harsh. Don’t make the mistake of forgetting to reapply sunscreen. You don’t want to spend the rest of your vacation miserably sunburned. If you have access to one, bring an underwater camera. You can capture some incredible photos of the inhabitants of Santa Maria Bay, and they make a great keepsake of your underwater adventures. The tour leaves daily at noon, and returns by 3:30 p.m. The cost for an adult, which is defined as anyone over the age of 12, is $49. Children 8-12 are $24.50, and kids under the age of 7 are free. If you are worried about being on the water for 3.5 hours without anything to eat, don’t worry. La Princesa provides tuna sandwiches, salsa, guacamole and chips. They also have an open bar. All of this is included in the ticket price. La Princesa also provides the snorkeling equipment, so you just have to show up with your swimsuit on ready to go. For more information, visit La Princesa and get ready to see the most beautiful marine life in some of the clearest water in Cabo San Lucas. One last reminder, I’m serious, don’t forget your sunscreen.